The Polisario leadership has been seriously in a bit pickle these last weeks by an unprecedented wave of claims, animated by certain young Sahrawis. The most important demonstration has taken place the 5th and 6th March in front of the headquarters of the Polisario leadership in Rabouni. Inspired by the popular revolts which have hurried up the fall of dictatorial regimes in Tunis and Cairo, the young Sahrawis in Tindouf camps have decided at their turn to ask their leaders for explanations. They ask for the bringing to trial of the torturers and corrupted Leaders, for more democracy and freedom of expression and movement. A group of young protesters which called itself “the 5th March movement” requires also the fall of the old Polisario corrupted guard, starting by its Chief Mohamed Abdelaziz, Ibrahim Ghali, Mohamed Lamine and Ould Bouhali. The young protesters believe that the latter have become rich at the expense of the Sahrawi populations by misappropriating the international humanitarian aids. The foodstuffs, medicines and clothes, as they stated, are sold in the black market in Algeria and in Mauritania, and the money thus collected is transferred to foreign bank accounts with the complicity of the Algerian generals. According to reliable sources in Tindouf camps, neither the strong arm tactics of the Polisario armed militia, neither the roadblocks put by the Algerian armed forces called for support, could not affect the strong mobilization of the young Sahrawis. The Sahrawi protesters supported by the Polisario dissident movement “Khat achahid” claim the departure of the old “corrupted and iniquitous” leaders at the head of the Polisario since more than 36 years, and their bringing to trial. The latter, insist the protesters, should restore all the funds robbed, which were intended for the poor Sahrawi population. 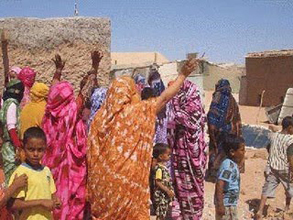 Despite of the arrest and imprisonment of many demonstrators and all the forms of intimidation to which are exposed the young Sahrawis, the “movement of 5th March” in Tindouf has confirmed that it is but the beginning of a protest which will end only with the putting into effect of all the claims of the Sahrawi populations in Tindouf camps.